Here's a good deed you can do that is not only a mitzvah, but yummy as well. 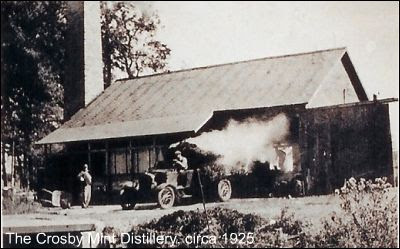 The Get Mint Farm in St. Johns, Michigan has been in the hands of the Crosby family since 1912. In 2005 the current generation of Crosbys took out some loans from Greenstone Farm Credit Services to finance some new equipment and cover operating expenses. Then the economy went south. The Crosbys had trouble making payments and Greenstone decided to call in the loans. Since they are having trouble even making the scheduled payments, calling in the full value of the loans essentially means Greenstone wants to seize the farm. The Crosby's lawyer tells them Greenstone has a history of this kind of behavior. The family has already sold off equipment, secured another loan from a different source, and is trying to sell off some of their land, but that still leaves them $325,000 short of what they need to keep the farm. A bill is pending in the Michigan legislature that will declare a moratorium on foreclosures, but, even if it passes, it will be too late to save the Get Mint Farm. That leaves us. The Crosbys need to sell 77,009 dram bottles of mint oil in the next week to raise the money they need. However, if you buy a bigger bottle, their costs for packaging will be lower. Go to the site, look around, and buy a few bottles. Don't let the fact that their site pushes the aromatherapy and herbal medicine uses of mint oil turn you off (if such things turn you off). This is plain old edible mint oil that can be used in cooking. Make some butter mints and take them to work, put a few drops in your cake frosting or in your tea, churn up some mint chip ice cream, or make your own creme de menth. If you need recipes, I'll post them. If you don't feel like cooking, buy their toffee, honey, or scented candles. Here is the link to their product page. Do it now, we only have a week to save the Crosby stills.